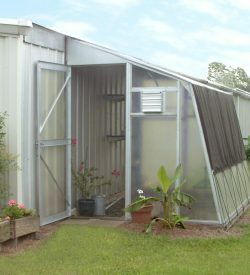 Achieving a comfortable and reasonable greenhouse temperature is easier to do in the winter than the summer. A combination of shade, air movement and humidity will often result in a good growing environment. Even so, the greenhouse should be carefully monitored whenever it is in use: summer or winter. In the northernmost regions of the country, fans and circulators will keep a greenhouse moderately cool in the summer. In all other regions the only effective and efficient method of keeping temperatures down to a reasonable level is evaporative cooling. There are two types of evaporative cooling: cabinet coolers (often called swamp coolers) and fan-and-pad systems. Cabinet coolers are very convenient for and popular in hobby greenhouses. As you look at both the diagram and the picture above you can develop an understanding of this simple but most effective method of greenhouse cooling. Three sides of the cabinet contain wood fiber pads which are fixed in louvered metal panels. The bottom of the cabinet serves as a water reservoir. Also located in the cabinet bottom is a recirculating water pump and a float valve which automatically controls the flow of water to the cooler. A motor and blower assembly inside the cabinet provide the air movement. Let’s assume your thermostat setting is 80 degrees. When the greenhouse temperature reaches the setting, both the pump and the motor are energized. Water is continuously pumped to the three pads and as the air is pulled through the pads, it is cooled and immediately discharged into the greenhouse. What size cooler is needed? A general rule of thumb is 7 to 10 cfm per square foot of greenhouse floor area. If you are in the arid Southwest, use 7 cfm/ft2. If you are in the Southeast or Gulf areas, use 9-10 cfm/ft2. As with any equipment need, our sales office will be glad to assist you or check your estimate. What will be needed besides the cooler? The cooler price includes a discharge duct. You will also need a control, like our 4E636 thermostat, and a mounting stand. The cooler operates best in an elevated position and space under the cabinet will be needed to drain the unit. Turner can provide a price quotation for a stand. Just give us the model number or cabinet dimensions and desired stand height. 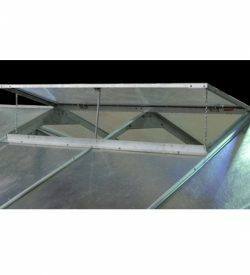 How do I know what size cooler is needed for my greenhouse? A general rule of thumb is 7 to 10 cfm per square foot of greenhouse floor area. If you are in the arid Southwest, use 7 cfm/s.f. If you are in the Southeast or Gulf areas, use 9-10 cfm/s.f. As with any equipment need, our sales office will be glad to assist you or check your estimate. Where do I put my cooler? Coolers can be set on top of a hard surface such as a concrete slab or brick pavers. They operate better and are easier to service when elevated. 3. The best location for the evaporative cooler is in the center of the back end- usually opposite the door end. The next best location would be offset in the space to the right or left of center in either end. How often should I replace my cooler pads? Pads should be replaced bi-annually. Over time and frequent usage, parts such as cooler pads, recirculating water pumps and motors must be replaced. Turner stocks them all. Call for a price quotation. What about cooler maintenance in the off-season? In the off-season scrape off any spots where the paint is rusting and re-paint. Unplug the cooler and clean out the inside where any filter pad particles have collected. Make sure there is proper belt tension and check out the water pump strainer for collected particles. Oil the internal bearings once a year. Cover your cooler for protection when not in use.